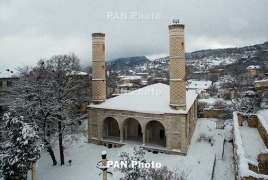 PanARMENIAN.Net - A restoration project for the Upper Mosque in the Nagorno Karabakh city of Shushi has been completed. The program was ordered by the Ministry of Economy and implemented by a group of Iranian experts. According to Deputy Economy Minister Sergey Shahverdyan, the renovation of the mosque is essential in terms of protecting the cultural heritage of Karabakh, as "any monument on its territory, regardless of it being a religious or cultural site, is the historic property of the people of Artsakh." The repair project of the Persian mosque, according to Karabakh experts, is well-prepared and fully complies with all the norms of heritage conservation. Shahverdyan said picking an Iranian company for the project was not accidental, given the mosque's connection with Persian culture and history.